The full patch notes can be read right now. Playerunknown’s Battlegrounds will receive its first major update tomorrow, an update which will help to stabilize the game and even add in some new items and weapons. According to a new post on the Playerunknown’s Battlegrounds website, the update will go live tomorrow, April 20th, at 3 a.m. EST. Furthermore, the process of implementing it reportedly won’t take longer than an hour. The development team explained how they plan to release a steady cadence of updates every month or so, and that some issues might take more than one patch to fix (hence why there’s a list of known issues in the below patch notes). ● The motorbike leans slightly to the right when being driven straight. ● The tires of the motorbike cannot be shot out at the moment. ● [Non-English Players] There are some mistranslated in-game texts and they will be shown in English. ● Made some improvements to address the issue of FPS drops when opening the inventory UI. ● Made improvements to address the issue of FPS severely dropping when in the vicinity of Yasnaya, Polyana & Georgopol. ● Rendering performance on PCs with minimum system requirements has been improved. ● Graphic performance and quality on PCs with minimum system requirements has been improved. ● Performance improvements have been made with relation to the items spawned in the world. ● Added Vector SMG. A very powerful SMG most appropriate for short to mid-range combat that is spawned in the world. ● Added Motorbike w/ sidecar. A sidecar-less version will be added in a future update. ● Added a 2X Aimpoint scope. ● Added a Ballistic Mask. ● Added 3 new color variations for the Dacia. ● Added the crossbow back into the game. ● Adjusted the density of environmental elements to be identical across all graphic options. ● Adjusted object placement to address issues of characters getting stuck. ● Adjusted placement of trees that were spawning inside houses or above the terrain. ● Adjusted the frequency of thunder sound effects. ● Revised certain system messages and item descriptions. ● Added descriptions for attachments. ● The dead team-mate icon will now disappear after a certain time and distance when in team modes. ● Map markers are now visible to all teammates. ● Names of teammates now appear on the world map. o You are now able to move sideways and backwards. o The REVIVE timer will no longer decrease when a teammate is attempting to revive you. o When attempting to revive a teammate, the reviving timer icon will now also be visible to the player being revived. o Adjusted the character position slightly when in the REVIVE state. o Made improvements to address the issue of characters shaking. o You are now able to open the world map when spectating. o You can now view the casting bar when the teammate you are spectating uses heal and/or boost items. ● You can no longer use heal and/or boost items when in water. o Adjusted the overall balance on all attachments. Adjusted the overall balance on Assault Rifles. We will continue to balance all weapons and attachments throughout Early Access. ● Fixed the issue that caused cars to temporarily stop when their tires get shot out. ● You can now sprint when in the crouch stance. ● Fixed the issue of “Armed/Unarmed” state not being applied when there are delays in the server network. ● The blood hit effect size now varies according to the weapon caliber. ● You can now move when in aiming and/or scoping in the prone state. ● Fixed an issue with the sitting position of the character in the back-right seat of the UAZ. ● Fixed an issue with the position of the left hand when reloading the AWM. ● Fixed an issue where aiming from vehicles was not accurate. ● The positions of bullet hits are now the same for both yourself and the others. ● Fixed an issue that caused the hit box for the head to be slightly larger than the actual head. ● Adjusted the ragdoll physics for dead characters to be more natural. ● Fixed an issue that caused the character to use the wrong aim offset when using the freelook function while holding a grenade. ● Fixed an issue that caused the landing-from-a-high-altitude motion to seem awkward when holding a pistol. ● Improved the quality of zoomed-in scope views. ● Bolt actions are now triggered even after the final shot has been fired, so that you can start re-firing as soon as reload is complete. ● Added swimming animations to go upwards and downwards. ● Fixed an issue that caused the reticle to appear even when in situations where you are not able to shoot. ● Your character now uses a different animation when in crouch stance while holding a melee weapon. ● Made improvements to the reload animations for the M249. ● Made improvements to the reload animations for the P1911. ● The muzzle flash is now brighter than before and is now visible from a longer distance. ● There are now sound effect differences for supersonic and non-supersonic bullet speeds. ● Made adjustments so that the sound of the bullet flying through air doesn’t play when shots are fired from a short distance from your character. ● You can now figure out what floor the opponents are at just by listening to their footsteps. ● Adjusted the firing sound of the SKS in mid to long range combat. ● Adjusted the volume of the footsteps. ● We have opened a test server to better manage our content and secure stability for our live environment updates. ● Additional in-game texts have been localized. ● Fixed a bug that caused some buildings to not be visible at long distance. ● Fixed a bug that caused weapons to clip through walls. ● Fixed a bug that caused the icons for certain “pants” items to not appear correctly. ● Fixed a bug that caused the PLAYERUNKNOWN shoes to not render properly. ● Fixed a bug that caused the hit effects to play at random. ● Fixed a bug that caused bald characters to have hair. ● Fixed a bug that caused disconnects after 5 minutes into a match. ● Fixed a bug that caused a knocked out player to be ejected in front of a vehicle. If knocked out in a vehicle, you will now be ejected to the side. 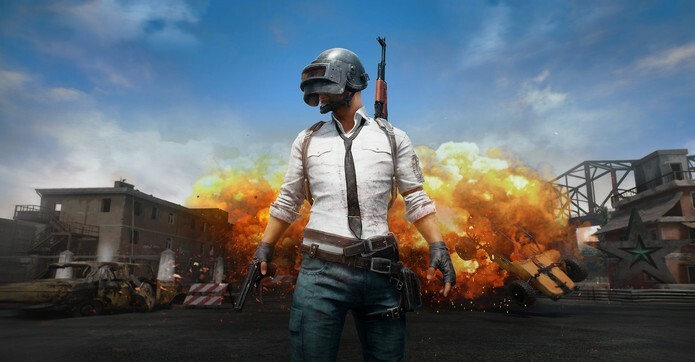 If the above patch notes have inspired you to finally give Playerunknown’s Battlegrounds a shot, make sure that you can run the game first by looking through our coverage of the game’s PC system requirements.